If you could hold a giant magnifying glass in space and focus all the sunlight shining toward Earth onto one grain of sand, that concentrated ray would approach the intensity of a new laser beam made in a University of Michigan laboratory. "That's the instantaneous intensity we can produce," said Karl Krushelnick, a physics and engineering professor. "I don't know of another place in the universe that would have this intensity of light. We believe this is a record." The pulsed laser beam lasts just 30 femtoseconds. A femtosecond is a millionth of a billionth of a second. 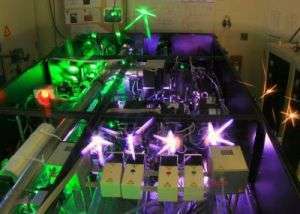 Such intense beams could help scientists develop better proton and electron beams for radiation treatment of cancer, among other applications. The record-setting beam measures 20 billion trillion watts per square centimeter. It contains 300 terawatts of power. That's 300 times the capacity of the entire U.S. electricity grid. The laser beam's power is concentrated to a 1.3-micron speck about 100th the diameter of a human hair. A human hair is about 100 microns wide. This intensity is about two orders of magnitude higher than any other laser in the world can produce, said Victor Yanovsky, a research scientist in the U-M Department of Electrical Engineering and Computer Science who built the ultra-high power system over the past six years. The laser can produce this intense beam once every 10 seconds, whereas other powerful lasers can take an hour to recharge. "We can get such high power by putting a moderate amount of energy into a very, very short time period," Yanovsky said. "We're storing energy and releasing it in a microscopic fraction of a second." To achieve this beam, the research team added another amplifier to the HERCULES laser system, which previously operated at 50 terawatts. HERCULES is a titanium-sapphire laser that takes up several rooms at U-M's Center for Ultrafast Optical Science. Light fed into it bounces like a pinball off a series of mirrors and other optical elements. It gets stretched, energized, squeezed and focused along the way. HERCULES uses the technique of chirped pulse amplification developed by U-M engineering professor emeritus Gerard Mourou in the 1980s. Chirped pulse amplification relies on grooved surfaces called diffraction gratings to stretch a very short duration laser pulse so that it lasts 50,000 times longer. This stretched pulse can then be amplified to much higher energy without damaging the optics in its path. After the beam is amplified to a higher energy by passing through titanium-sapphire crystals, an optical compressor reverses the stretching, squeezing the laser pulse until it's close to its original duration. The beam is then focused to ultra-high intensity. In addition to medical uses, intense laser beams like these could help researchers explore new frontiers in science. At even more extreme intensities, laser beams could potentially "boil the vacuum," which scientists theorize would generate matter by merely focusing light into empty space. Some scientists also see applications in inertial confinement fusion research, coaxing low-mass atoms to join together into heavier ones and release energy in the process. A paper on this research, "Ultra-high intensity 300-TW laser at 0.1 Hz repetition rate," is published online in the journal Optics Express. The full text is available at www.opticsinfobase.org/abstrac … cfm?URI=oe-16-3-2109. Yanovsky and Krushelnick are authors of the paper. A great new tool for discovery. While I don't disrespect particle accelerators it is nice to see other forms of instrumentation being explored. That bodes well for fast ignition nuclear fusion. 30 fs * 300 TW = 9 Joules per shot. "Such intense beams could help scientists develop better proton and electron beams for radiation treatment of cancer"
Yeah the usual BS for the public, who might wonders, what good that does. It may cure cancer. Or may not! Do physicist have to lie now, to get funding for their toys ? Apparently so. Short beam at 0.009 mm. >Do physicist have to lie now, to get funding for their toys ? Apparently so. Yeah but its not really a lie its just a very improbable statement i dont like it either. The real problem is public ignorance. I think we might reach the limit of democracy soon, since with the pace technology develops and with the impact it has on our lives a general uneducated public (or ignorant politicians) are not longer in position to make any informed decisions. I hope humanity can develop a governing body populated by scientists representing various disciples and acting in our best interests.